works like a blacksmith's forge. New product just added to our line!! 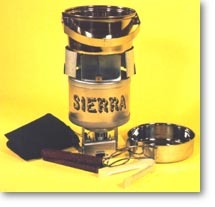 Click HERE for the Sierra TT Titanium Stove. 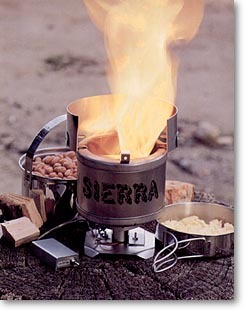 The SIERRA stove is ideal for backpackers, distance bikers, back country horsemen and other campers looking for an extremely lightweight, dependable and powerful stove. The SIERRA is an excellent choice for Boy Scouts, providing a safe and simple way to learn the skills of campfire cooking. The SIERRA burns twigs, bark, pine cones and other woods readily available around a campsite, as well as charcoal and other solid fuels. The SIERRA incorporates an adjustable speed fan, creating a forced ventilation system that provides intense heat and efficient burning. The SIERRA weighs only 1 lb yet creates up to 18,000 BTU/hr, enough heat to boil a quart of water in four minutes. A single "AA" battery powers the fan for 6 hours. The optional "D" CELL POWER SUPPLY provides over 35 hours of cooking time. The SIERRA SET includes a polished stainless steel kettle with frying pan cover, a wrap around windshield for faster and more efficient cooking, a cross grate for burning long sticks, tongs, a sample of ZIP FIRES and a nylon carry sack. The entire SIERRA SET weighs just 2 lbs. The SIERRA stove nests inside the kettle for easy backpack storage.